So Monday’s dinner was, how do you say? Interesting. 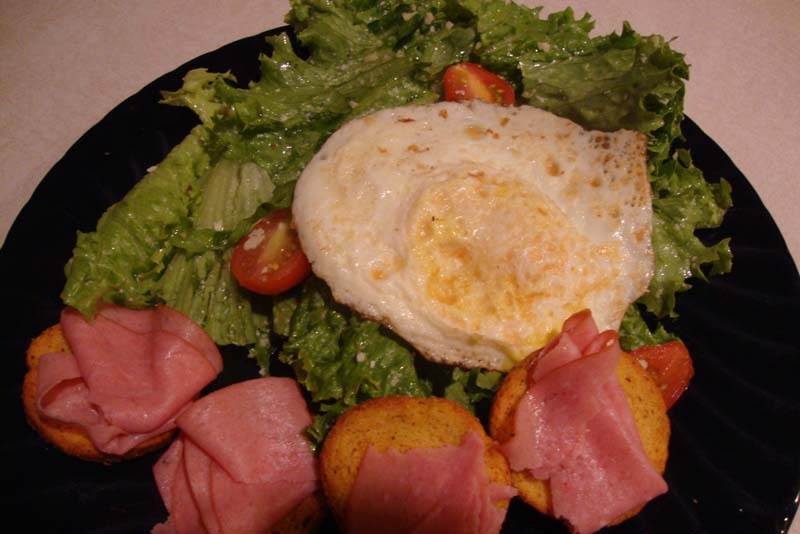 If you recall I was going to make fried-egg Caesar salad with prosciutto bread-sticks. My husband-to-be was so nice to go grocery shopping but left the store with about half of the things I needed this week. I don’t blame him too much since the grocery list included items like fish sauce and ginger root but boy have I had to improvise over the last few days. The Gazpacho turned out yummy and thankfully we had that as a precursor to the meal because I don’t know if my Fried-Egg Caesar Salad would have entirely filled me up. 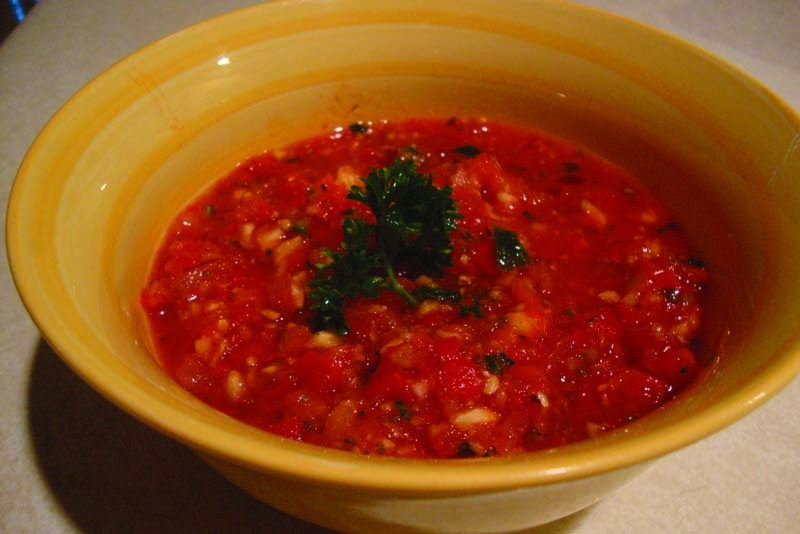 The Gazpacho was thick and almost salsa-like but it was sooo good! Instead of bread-sticks I had to use toast banquettes and instead of sun-dried tomatoes I just through in cherry tomatoes. I don’t think this turned out the way it was supposed to but I don’t think I will try making it again either. Not bad, not great. 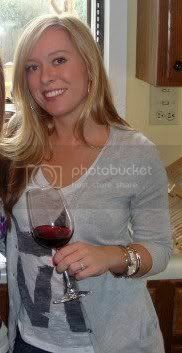 I can deal with Monday nights because of the Bachelorette. So I cozied up on my couch after my 2 mile run and grabbed a bowl of ice-cream. 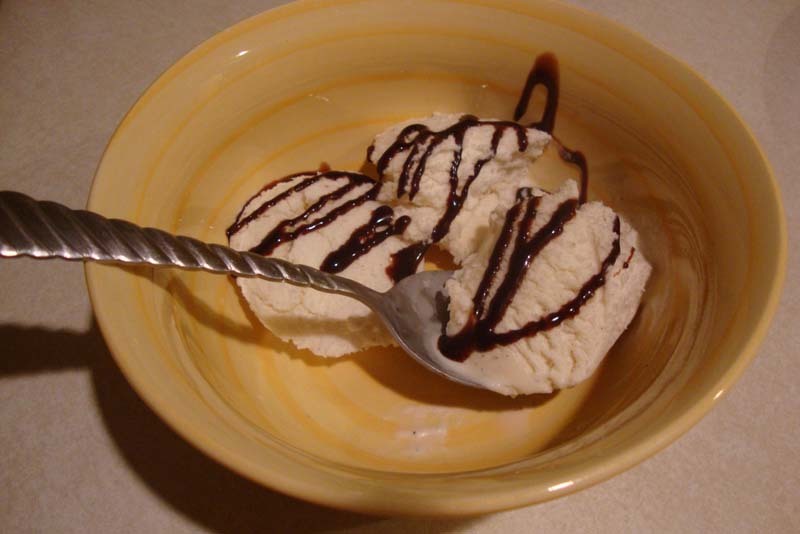 Can’t go wrong with vanilla-bean and chocolate syrup! Tuesday was a busy, busy day. After work I had a meeting from 7-8 and when I got home I was starving. I should probably add that my meeting was held at Arby’s and while I was watching people eat their roast beef sandwiches and curly fries I was salivating. But I held strong because I was excited to try out a tofu recipe. I know, that’s a leap right? Roast beef lusting to Tofu? Tuesday’s dinner was originally scheduled for Wed. but with my meeting and getting home so late, grilling tilapia really wasn’t in the cards, so that is what I will cook tonight. Let me tell you how good this was! I was impressed! I encourage you all to try this recipe. 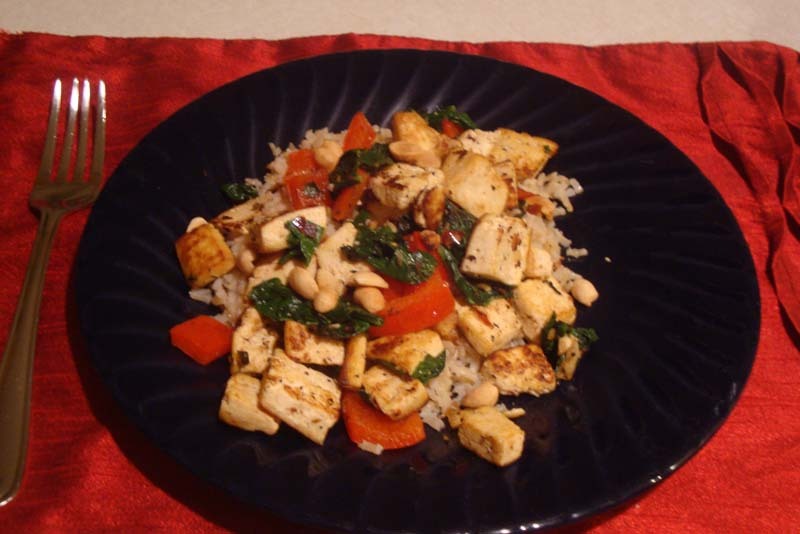 It’s easy and probably a good “first” tofu dish for those of you that are willing to try it. Heat oil in wok over high heat. Add bell peppers, ginger, and garlic; sauté until peppers just begin to soften, about 2 minutes. Add tofu and green onions; toss 2 minutes. Add next 3 ingredients. Toss to blend, about 1 minute. Add spinach in 3 additions, tossing until beginning to wilt, about 1 minute for each addition. Mix in basil. Season with salt and pepper. Sprinkle peanuts over. Once again I got this recipe of Epicurous. I was unable to attend Group Power last night due to other obligations and I missed it. I am well aware of how that sounds and how lame I am, but I can’t help it. I am looking forward to getting in a class tomorrow before I leave for the beach. I like tofu, but I’m nervous to cook it myself… Maybe this was the inspiration I needed! Cute blog. 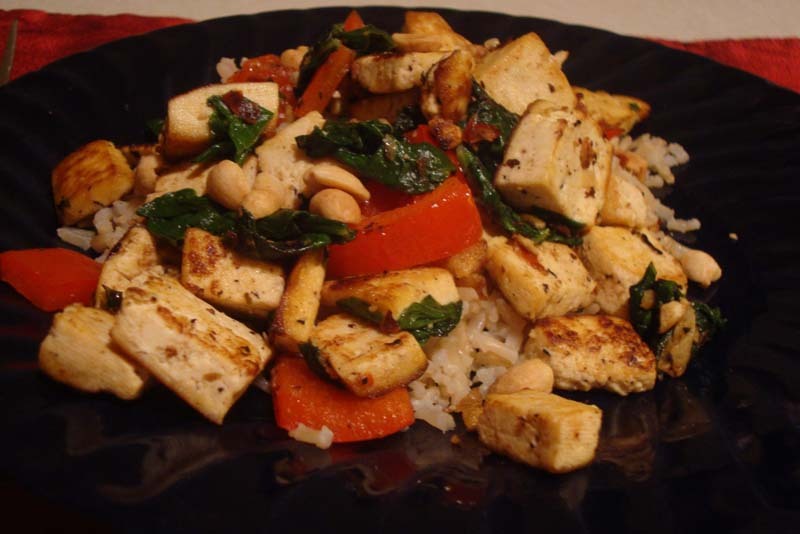 I want to see you try a tempeh dish… yummers!! !